— It’s been three weeks since Amy started Barre3 and Jordan started CrossFit. Jordan’s self-confidence is coming back (slowly) after losing a 200 yard run to Grandma. He’s almost lifting as much as the girls, too, so that’s progress. — We’ve been listening to Dave Ramsey’s and Michael Hyatt’s podcasts in the car when we’re out and about. It’s helping us stay disciplined with our new sleep, nutrition and exercise routine (more on that in coming weeks! ), and motivated to keep our spending as low as possible to keep making extra payments on our mortgage. — In-between podcasts, Amy’s been playing Justin Bieber’s new album and the soundtrack from The Newsies. Our favorite line that we just can’t get enough of? 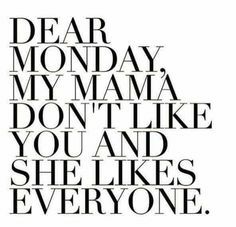 My mama don’t like you and she likes everyone. We thought this meme of that lyric was pretty on point. We just can’t help but sing it around the house. — We’ve been eating at home for as many meals as we can. Lots of protein shakes and salads — and maybe a glass of wine with lunch… We justify it like people justify changing their sleep schedule before traveling to the East or West Coast. We’re going to have a glass at lunch in Italy this summer. Better start practicing now! — We’ll share some of our favorite new recipes in upcoming blog posts. — For the motivation behind the protein shakes and salads, see below. — The pool. Oh, the pool. It’s heating up in Arizona and that means the swimming pool (and jacuzzi) are so refreshing right now. We’ve been sneaking out for a quick swim and a little “lay out time” every morning after working out. It’s been SO good for the soul to give ourselves the first few hours of the day. — Unfortunately, Amy’s still white. Because Irish doesn’t tan. — Jordan, on the other hand, is looking a little more like Mowgli the Mancub every day. Ya know, minus the long hair. He uses too much gel for that. — So… we almost lost Mr. Carson. And when we say “we,” we mean JORDAN. One of Mr. Carson’s favorite things is to lay just outside the front door and roll around on the cement. A few nights ago, Jordan had let the cats outside for their “roll time” and thought they’d both come back inside. He thought. So he shut the door. When he realized Mr. Carson was gone (about five minutes later), he started sprinting around the complex in a panic. — And found Mr. Carson BY THE POOL FENCE. Like father, like son, we guess. Just thankful both little bitties are safe. — In related news, Amy trained Mr. Carson to cuddle under the sheets at night, which is basically the cutest thing ever. — We’re off to speak at the Connect Marriage Retreat on Monday and can’t wait to decompress from work and spend intentional time with each other and other married couples who are in business together. — Plus, one day, we get to have ALL YOU CAN EAT waffle fries from Chick-fil-A. So when they say you’ll feel closer to God at this retreat, they’re right, because that’s basically Heaven. What a fun post! I love how much fun you guys have. Aw! Thank you!! We definitely do! You guys make my heart really happy 🙂 I’m very glad that I found your blog those many months ago. There is nothing more terrifying when you think your sweet baby kitties have ESCAPED and are in grave danger! I grew up with indoor/outdoor cats, and always felt so anxious when one would decide it wanted to go outside for the night 🙁 Never again!! Thank you for following along! Yes!! So scary! !